Osaka, Japan – Recosoft Corporation the developers of workflow automation plug-ins for Adobe(R) Creative Cloud(R) and creators of PDF conversion software has released ID2Office 2019, the newest version of the InDesign to Word, PowerPoint and Keynote formats conversion plug-in for Adobe InDesign(R) CC 2019. ID2Office 2019 adds support for Adobe InDesign CC 2019, the latest release of InDesign CC for macOS and Windows. Additionally, ID2Office 2019 recognizes the split/span property, resulting in enhanced layout preservation. 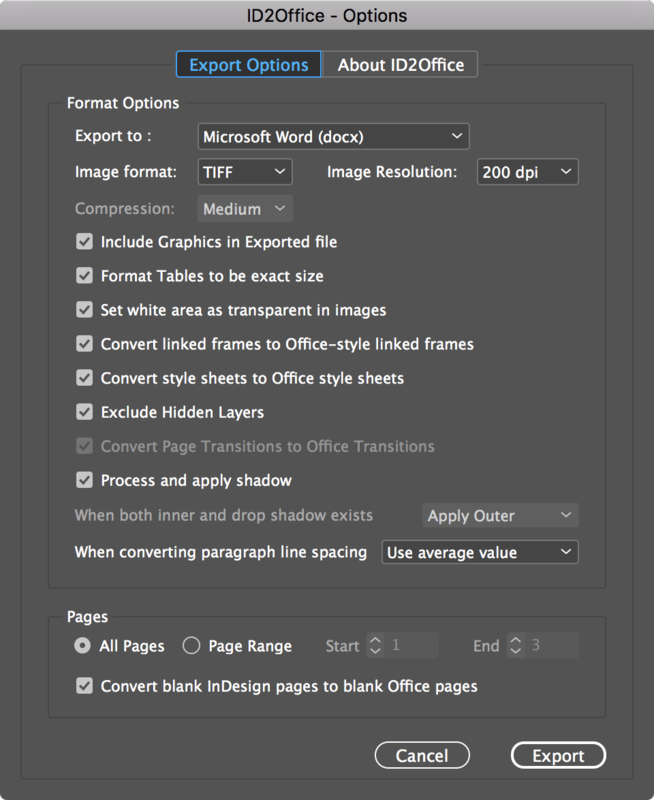 Finally, ID2Office 2019 now allows converting images to JPEG type, significantly reducing the file size of image-centric documents. ID2Office 2019 now supports and integrates with InDesign CC 2019. InDesign CC through CC 2018 are supported as well. You can now specify JPEG as the image type and specify the compression quality of the JPEG images; resulting in smaller file sizes. ID2Office 2019 includes layout enhancements where span/split column property are recognized, and the layout is preserved as accurately as possible when converting to any of the supported formats. Tab markers are now processed and replicated accurately. Additionally, grouped objects with text/tables are now editable in the resulting Word, PowerPoint and Keynote file. Recosoft Corporation has pioneered PDF2Office(R), the de-facto PDF-to-Excel, PDF-to-Word, PDF-to-PowerPoint, PDF-to-OmniGraffle conversion utility; PDF2Office(R) for iWork, the PDF-to-Keynote, PDF-to-Numbers and PDF-to-Pages conversion application; ID2Office, the InDesign-to-Word, InDesign-to-PowerPoint converter; and PDF2ID(R) the de-facto PDF-to-InDesign conversion tool. The company is a leader in designing and delivering PDF converters and InDesign software solutions enhancing workflow automation and productivity. ID2Office, PDF2Office, PDF2ID, PDFtoID are trademarks or registered trademarks of Recosoft Corporation in the US and/or other countries. Microsoft, Excel, PowerPoint, Word and the Office logo are trademarks or registered trademarks of Microsoft Corporation in the US and/or other countries. Adobe, InDesign and Creative Cloud are either registered trademarks or trademarks of Adobe System Incorporated in the US and/or other countries. Apple, Macintosh, macOS, Mac, Numbers, Keynote, Pages, iWork, iPod, iPhone, iOS, iPad are either trademarks or registered trademarks of Apple, Inc. in the US and or other countries. All other trademarks are recognized and are the property of their respective owners.